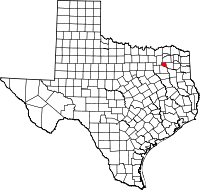 Rains County is a county located in the U.S. state of Texas. As of the 2010 census, its population was 10,914. Its seat is Emory. The county (and county seat) are named for Emory Rains, a Texas state legislator. In 1970, Recorded Texas Historic Landmark Number 10860 was placed in the county courthouse lawn. According to the U.S. Census Bureau, the county has a total area of 259 square miles (670 km2), of which 229 square miles (590 km2) is land and 29 square miles (75 km2) (11%) is water. It is the fourth-smallest county in Texas by land area and fifth-smallest by total area. As of the census of 2010, there were 10,914 people, 4,188 households, and 2,680 families residing in the county. The population density was 48 people per square mile (19/km²). There were 5,269 housing units at an average density of 23 per square mile (9/km²). The racial makeup of the county was 91.2% White, 2.92% Black or African American, 1.0% Native American, 0.5% Asian, 0.04% Pacific Islander, 2.55% from other races, and 1.6% from two or more races. 7.7% of the population were Hispanic or Latino of any race. There were 4,188 households out of which 28.80% had children under the age of 18 living with them, 61.90% were married couples living together, 9.10% had a female householder with no husband present, and 25.90% were non-families. 22.30% of all households were made up of individuals and 11.20% had someone living alone who was 65 years of age or older. The average household size was 2.60 and the average family size was 2.92. In the county, the population was spread out with 23.80% under the age of 18, 7.40% from 18 to 24, 25.10% from 25 to 44, 27.70% from 45 to 64, and 16.10% who were 65 years of age or older. The median age was 41 years. For every 100 females there were 99.80 males. For every 100 females age 18 and over, there were 96.40 males. The median income for a household in the county was $46,531 and the median income for a family was $40,329. Males had a median income of $31,983 versus $21,594 for females. The per capita income for the county was $22,933. About 11.40% of families and 14.90% of the population were below the poverty line, including 17.50% of those under age 18 and 14.10% of those age 65 or over. Rains County is part of the Dallas/Fort Worth DMA. Local media outlets are: KDFW-TV, KXAS-TV, WFAA-TV, KTVT-TV, KERA-TV, KTXA-TV, KDFI-TV, KDAF-TV, and KFWD-TV. Other nearby stations that provide coverage for Rains County come from the Tyler/Longview/Jacksonville market and they include: KLTV, KYTX-TV, KFXK-TV, KCEB-TV, and KETK-TV. The majority of the county is served by the Rains Independent School District located in Emory. The far southeastern portion of the county is served by the Alba-Golden Independent School District. The far northwestern corner of the county is served by the Lone Oak Independent School District. A portion of north central Rains County is served by the Miller Grove Independent School District. ^ R., DAVIS, STEVEN (15 June 2010). "RAINS COUNTY". www.tshaonline.org. Retrieved 29 July 2018. ^ "Rains County - Emory, Rains County, Texas". Recorded Texas Historic Landmark. William Nienke, Sam Morrow. Archived from the original on 7 July 2011. Retrieved 19 February 2011. This page was last edited on 29 July 2018, at 16:32 (UTC).